Recently I had an opportunity to participate on a panel and I loved the title: The good, the bad, the scary and the future. It caused me to reflect on the state of the industry both in terms of where we are now and what can we look forward to in the near future. Here are my thoughts from that panel. See if you agree. If you have any other ideas you would like to share, use the comment section to do that. Publishing options—there continue to be more ways for authors to publish books and get them into the hands of readers. Services, formats and distribution opportunities all continue to increase. Connecting with readers through social media—savvy authors are taking advantage of social media to find potential readers and have them share about the book with their connections. Technology like Meet Edgar and Bookgrabrr have made it much easier. Authors aren’t as isolated—writing a book is a solitary activity, but the journey doesn’t have to be. Platforms like The Author Learning Center help authors get connected with others who can provide help and encouragement along the way. Still Alice started as a self-published book and became an Oscar winning movie. Hollywood is more interested in ever in books—I think I read somewhere that there are 28 movies being released in the near future based on books. That means more opportunity for authors no matter how they publish. Anybody can get published—with self-publishing still growing, it means almost anyone can become an author. That means there are more books available to readers than ever before so it has never been more important to have a well written book and compelling story. Competing for attention is challenging—there are so many things vying for our attention that it is more important than ever to have a targeted marketing campaign. How hard it is to write a good book—I think people who start out with an idea underestimate how much work and skill it takes to write a good book. That is why it is more important than ever that a writer be committed to the craft and business of being an author. ….it is more important than ever that a writer be committed to the craft and business of being an author. Reading for pleasure in some countries is declining—studies have confirmed fewer people are reading as a leisure activity. There are still some exceptions. Book clubs create power readers. Emerging countries seem to be cultivating more voracious readers, but in a number of established countries, the potential customer base could be shrinking. Opportunities with bookstores and traditional publishers are waning in some markets and genres—As operating bookstores becomes more challenging and traditional publishers consolidate, there can be fewer opportunities for authors. That is not always the case depending on the market and type of book, but there has definitely been a decline in opportunities from even 10 years ago. Self-publishing will continue to grow—since we first drew pictures on a cave wall, we have always wanted our ideas and stories to have permanence. Because of that I believe self-publishing will continue to expand to more people and more countries. Hollywood will find more first time and self-published authors—as the demand for new ideas and stories continues to grow to feed the number of cable and streaming channels, Hollywood will expand where they look for ideas. Movies like The Martian starring Matt Damon and Still Alice for which Julianne Moore won the Oscar started as self-published books which I believe opens the door for other authors who have not published traditionally. Book shops that become a community focused will thrive—while bookstores have been challenged in some markets, we have also seen a number of retailers flourish who use their store as a place to gather people around ideas and events. Over the past year, I have gotten to know, Adam Hall, who is a book designer for indie authors. His website, www.aroundthepages.com is a showcase for his work, but Adam also does design for a variety of diverse projects and audiences. He has worked with both first-time and experienced authors on one book or a series. I asked him to share some of his insights recently about designing for books. His answers to my questions follow below. Type is as important as the image on a cover. How did you start designing book covers? I got my start by doing a favor for a friend, Ernie Lindsey. He is an indie writer who has made the USA Today Bestseller list with his series, Sara’s Game. A few years ago he needed some help tweaking a cover. Ernie and I have now collaborated on about 10+ projects. Through his, and other’s encouragement, I decided to make it my focus in my design career. From your experience what are the keys to making a book cover design work really well? 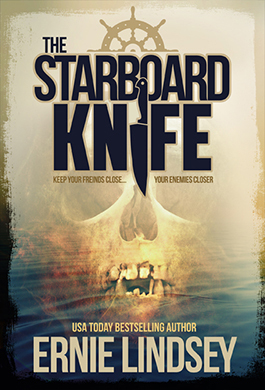 The cover needs to convey the genre, and give a clue into the story. It doesn’t need to tell the whole story, but create enough intrigue to catch the readers’ eye. Focus on typography as much as the images. If the art is brilliant, but the title text is all wrong, the whole piece falls flat. The art and typography have to work together. How does book cover design differ from other design projects you do? In addition to book covers, I work with musicians and bands on artwork and websites. With music design you are basically marketing the individual or group. With book covers you are telling a story. It is fun to find that nugget in the story that you can use in artwork to capture that the idea in the book in one image. That makes book cover design more challenging than doing design for music, but that’s part of what makes it fun. The thumbnail is what they will likely see first if they search online, so it is critical the thumbnail makes a good first impression. What design mistakes do you see most often on book covers? One common mistake is not considering all formats when doing the cover design. You have to make sure the cover looks great in thumbnail size AND full size. You only have a split second to catch a potential reader’s eye as they’re searching out that next book. The thumbnail is what they will likely see first if they search online, so it is critical the thumbnail makes a good first impression. Finding the one image that captures the story is a key to good book design. What tips would you give to first time authors? I think two of the most important people an author can find are a good editor and designer. You have to trust both to make your work the best it can be. When it comes to working with a designer, do your due diligence and look at a designer’s previous work. A friend of mine has said “a good cover won’t always make you want to buy a book, but a bad cover will most definitely make you not buy one”. I thought that was a brilliant point. 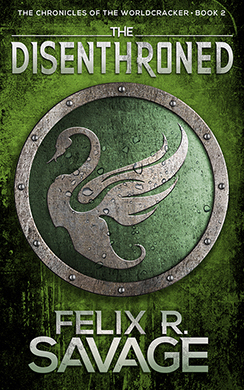 Find a designer who can help make your cover one that motivate readers to buy your book. 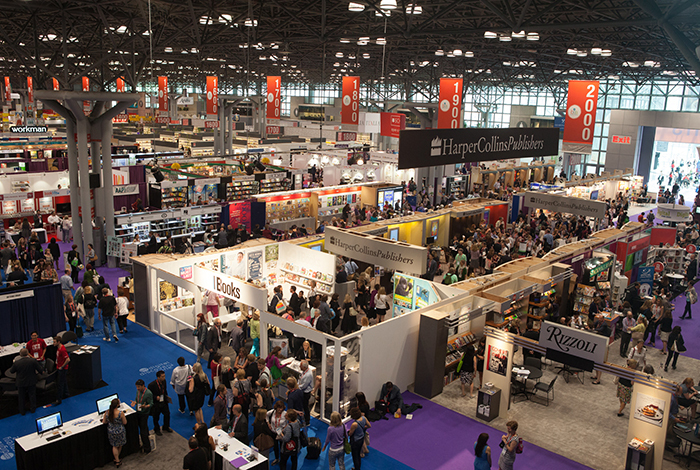 4 takeaways from BEA (Book Expo America) that authors should know about. 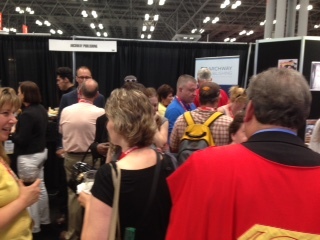 Last week I attended the premier industry tradeshow, Book Expo America, also affectionately known as BEA. Here were some of my observations. The death of publishing is greatly exaggerated. While publishing has gone through significant changes the past year, the floor was still filled with lots of new books and authors. Then on the weekend, the doors were open to readers and the floor was filled with lots of eager fans ready to meet some of their literary stars. Publishing is still a place for start-ups. One of the more interesting sections for the trade show floor was dedicated to start-ups focused on the publishing industry. I did not get a chance to walk all the booths in Start-Up Alley, but judging by the amount of space they occupied, there were a number of new ideas trying to gain traction. Time will tell but it was encouraging to see investment in new ideas for readers and authors. Using social media for discovery is a big topic. As expected a hot topic was how to use social to promote discoverability. One of the most interesting new entrants is Bookgrabbr. According to their site, BookGrabbr is an App and web-based technology product designed to expand the brand and media platform of any author by creating and increasing visibility in the book community and securing new readers and customers for those authors’ books. Smiling Archway authors packed the booth at BEA. One author even wore a Superman cape. Archway Publishing authors were extremely happy. At the end of the show, Archway Publishing hosted a reception for authors. As usual, the authors who attend BEA and the event, loved it. I heard two words consistently, “overwhelming and exciting”. That is how authors felt about the time at the Expo and at the reception. It is always a great way to close out the day. 3 statements I hear from first-time authors that make me cringe. Over the years, I have had hundreds of conversations with authors and there are three phrases I sometimes hear that give me pause. Describe who you think will most likely read your book in terms of gender, age, occupation if relevant. Identify where you think your audience looks for information. If they are engaged on social media, be specific about which platforms, such as Facebook or Twitter. Think of anywhere locally where your target audience might congregate? One of the great myths among first time authors is that if they get published by a traditional publisher, then someone else will do the marketing for their book. The reality is no matter how you publish, you still need to be involved in the promotion of your book. One of the key ways is to use social media to connect with and cultivate an audience. In fact, one the criteria most traditional publishers consider when acquiring a title is the platform of the author. If you want to learn more about how to develop your marketing acumen, you might want to consider reading this post, Confused about how to do book marketing? 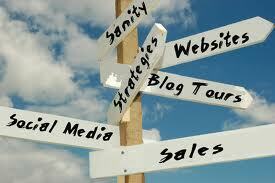 Here is a simple way to build an effective marketing plan.